What You Should Know if Moss is Growing on Your Trees | Mr. Tree, Inc.
Because of the climate in the northwest, tree moss is extremely common. It’s not always necessary to see tree moss as a concern with your trees in Oregon, but you should keep yourself informed when it comes to tree moss. Some people like it, because it creates a beautiful look. But here are some things to keep in mind when it comes to moss. One negative about tree moss, especially excessive amounts, is the weight it adds to your trees in Oregon. Obviously, the more weight your trees have, the more susceptible they are to tipping or uprooting. Moss growth can also lead to various diseases in the trees it lives on, especially if those trees are not native to cool and moist habitats. During a windstorm, the additional weight provided by moss (which absorbs water) can lead to branches snapping off. In regards to the disease, tree moss can cover the tree vastly, making it hard to detect when there are signs of disease. With some diseases, if treated early, they’re not a major problem. Tree moss complicated those matters with your trees in Oregon, so you may have to go up and inspect your trees a little bit closer. Now when do you think your trees are most susceptible to moss? If your tree is in low light and high moisture, that could be inviting for moss to appear. The trees most susceptible to the diseases that can sprout are birch, maple and oak. For those trees, you need to make sure they’re receiving the appropriate amount of ventilation and sunlight. Once moss appears, like we said prior, some people like to keep it in place for it’s look, but it’s important to know whether or not the moss is harming your tree. People who aren’t experts in trees shouldn’t necessarily make that distinction, so we’d recommend calling an arborist to take a closer look. Now, if you are a do-it-yourselfer, you can remove the moss yourself, but it needs to be done with great care to ensure you don’t do any damage to your trees and their branches. One thing that’s important to note. Even if you remove the moss, this won’t change the conditions of the tree, which do encourage the moss to grow back. That means you need to keep a close eye on your trees, and maybe you’ll want to do some maintaining so it doesn’t accumulate so much before you act. Again, if you’re not 100 percent sure about how to remove moss the right way, then don’t. 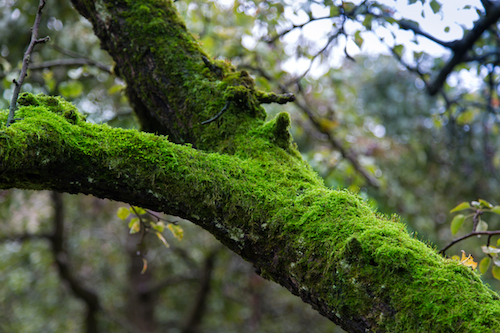 You’ll have peace of mind if you call a reputable professional who can take the moss off your trees in Oregon for you. Now, while using a power washer seems easy, it’s not the best way to get rid of your moss. We suggest doing it by hand, even though that can be quite time consuming. Power washers can damage the sensitive leaf buds, and that’s the last thing you want. Also, you need to know when the best time to remove moss is. We suggest dormant season, which the leafless branches are much easier to clean. You also run less risk of damaging the tree, which we want to prevent against. Please note that you want to call your arborist with plenty of advanced notice if they’re going to do the work, because demand will certainly be high during dormant season. Now there are ways you can be preventative when it comes to moss, so you try to make sure it doesn’t become an issue in the first place. First, it’s a good idea to ensure trees don’t get wet during normal lawn watering. You can even cut down the amount you water your lawn. The more shade you have, the less water it needs. Contact your gardener and ask how much water is required before making any drastic changes. You can even test your PH levels of your soil with a soil-testing kit, available at garden stores. You can treat acidic soil with lime to make the conditions unfavorable for moss. Another thing you can do is thin out the branches of your tree so the trunk has access to more direct sunlight. You want to be careful with this, however, and consulting an arborist is advised to make sure you don’t damage your tree. We want to help the tree, not hurt it. Remember, if you remove the moss by hand, it’s less destructive to the tree. If you use a power washer, you must be especially careful, because the excessive force can cause damage. The bottom line is this — if you have a moss problem and you are not 100 percent sure of how to handle it, then call a certified arborist. While it may cost you some money, it will alleviate any headaches that are caused by trying to do work you are not qualified to do. And even worse, poor work can damage or even kill your tree, defeating the whole purpose of moss removal in the first place. Also, when looking into tree arborists, make sure you do your research! That means using Google to find testimonials. Ask for references and call them. You don’t want to have them do a bad job on your property. Ultimately, if you’re lazy with your research, you’re more likely to have a problem with your contractor. At the end of the day, all we want is for our trees to be moss-free and healthy so they can thrive for many years to come.